Enjoy front row seats, with this modern lakefront retreat! Boasting spectacular views of Lake Lugano, this 2 bed apartment in the Castagnola suburb of Lugano offers a captivating retreat for all seasons. Easily reachable by lift, the 1st floor apartment promises space, modernity and home comfort. The spacious lake view reception with balcony access offers a flexible room in which to relax, entertain and dine away. Complementing a sofa suite of cream leather sofas, the elegant dining area for 6 provides an ambient setting for year-round dinner parties, whilst outside the sunny lake view balcony with awning provides a lovely setting for laid back alfresco feasts. A fully-equipped separate Kitchen with balcony doors is ready and waiting for budding chefs to enjoy, whilst for those looking to dine out, Lugano city offers a cosmopolitan offering of Italian and world cuisine dining opportunities. The apartment’s 2 bedrooms are perfectly suited for groups of 4. A generous size Double bedroom with mirrored wardrobe offers a restful ambience for holiday slumbers, whilst the second bedroom with 2 Single beds provides welcome flexibility for children or friends. One full bathroom and a 2nd modern shower room with laundry facilities completes the internal layout of this gorgeous retreat. Outside, the 1st floor apartment enjoys a shared garden and glorious lake view surroundings. From the city quarter of Castagnola, guests are within convenient reach of the city centre, the lakeside Parco Civico, family-friendly Lido, Casino and Tennis Club (all 8 minutes’ taxi ride away). The vibrant modern centre of Lugano, home to designer shops, cultural attractions, universities, colleges and businesses are also easily accessible by car. Perfect for year-round escapes, the beautiful city of Lugano promises a truly cosmopolitan lake getaway; with world restaurants, designer shops, cultural museums, art galleries, sport activities, a buzzing nightlife and visitor attractions all on standby. With the beautiful walking routes of Monte Bre and the Ancient Olive Trail close by too, as well as the ski resorts, Monte Tamaro Adventure Park and Lake Como attractions, this holiday retreat offers the perfect base for those seeking serene lake view moments with the combination of a classic city break and outdoor adventure rolled into one. Lugano is easily reachable by train, ferry, bus, plane and car; with a mainline train station in the centre, Lugano airport (16 minutes’ drive), frequent public transport links and fast road links to Lake Como (40 minutes’ away). The beautiful apartment offers generous sleeping arrangements to suit 4. Private parking features close by. Situated in the desirable city quarter of Castagnola-Cassarate, the lakeside apartment allows guests to indulge in a peaceful lake view setting, as well as dip in and out of the city highlights whenever the choose! Nearby highlights in the neighbourhood include the Museo delle Culture and the Archivo Storico centre. The lakeside residence is also conveniently placed 8 minutes’ taxi ride from Lugano’s beautiful centre; where a popular family Lido, the lakeside Parco Civico with Art Museum and also the throng of boutique designer shops, world restaurants, fashionable bars and cultural attractions await. A shopper’s paradise, Lugano boasts designer shopping boulevards, antique shops, traditional markets and modern malls. Lugano’s charming cafe-lined piazzas, idyllic lakeside promenade, panoramic vistas and scenic boat trips also provide an added dose of Italian-style romance too; for a truly unique and relaxed Swiss lake city stay. Popular attractions and pastimes include a trip to the Museo Civico di Belle Arti, the Museo Cantonale d’Arte, the Museo Cantonale di Storia Naturale, the family-friendly Lido di Lugano, the tennis club, Cattedrale di San Lorenzo and treasure trove of surrounding walks including Monte Bré and the ambient Olive Trail from Gandria (under 10 minutes’ drive away). 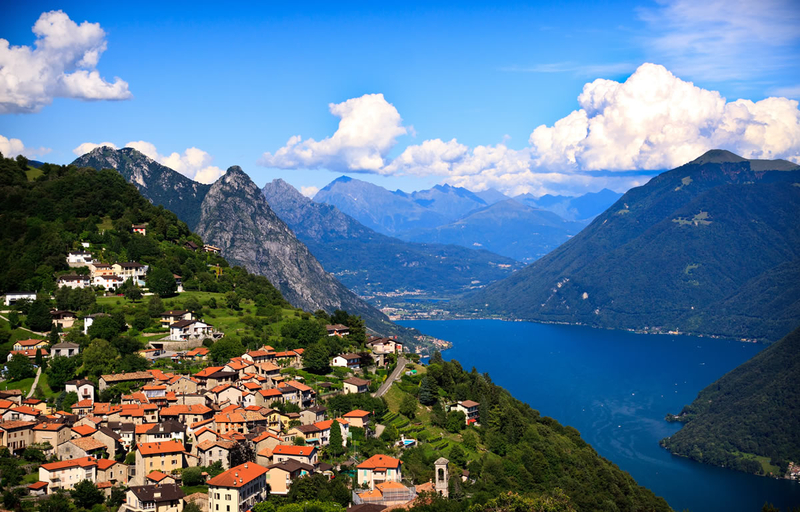 Lugano is very well-serviced by ferry, bus, road and train and airport links. The apartment itself is just a 15 minutes’ taxi ride from Lugano’s Main Train Station and 16 minutes’ taxi ride from Lugano Airport, making it the perfect choice for those looking to leave the car at home. If you are looking to travel by car, then the stylish apartment also places guests within easy driving distance of Lugano’s Golf club, the many tourist attractions of Ticino and the beautiful central lake on Lake Como (with Menaggio accessible by car in just 40 minutes).